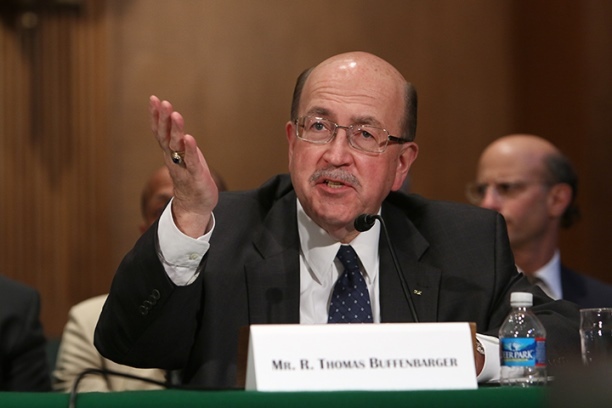 The besieged U.S. manufacturing industry needs a national strategy to stay competitive and create a foundation for future prosperity, said IAM International President Tom Buffenbarger at a recent Senate hearing. Buffenbarger was one of five experts called to testify at a Senate Banking, Housing and Urban Affairs subcommittee inquiry into the “Drivers of Job Creation.” Click here to watch the entire hearing. Buffenbarger’s opening statement begins at 43:45. “Significantly, even with the addition of 650,000 manufacturing jobs since the bottom of the Great Recession, the U.S. has still lost over five million manufacturing jobs since the start of this century,” said Buffenbarger. Job-killing trade deals like NAFTA, the implementation of Permanent Normal Trade Relations with China and the U.S.-Korea Free Trade Agreement have shipped millions of American jobs overseas and put the U.S. manufacturing industry on the ropes, said Buffenbarger. The manufacturing sector contributes $1.7 trillion to the U.S. economy, or about 9 percent of GDP, according to the U.S. Bureau of Labor Statistics. “We strongly believe that manufacturing is critical to our national economic recovery,” said Buffenbarger. Buffenbarger proposed reviewing federal incentives to corporations that outsource manufacturing, more accountability on the part of government contractors who say they are creating or maintaining jobs, trade deals that make sense for U.S. workers and stronger Buy American requirements. He also stressed the importance of reauthorizing the Export-Import Bank and creating a new manufacturing development bank.